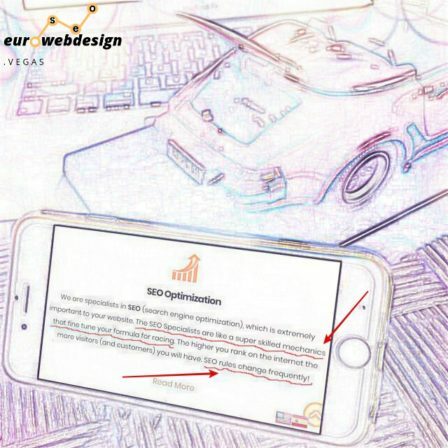 What is SEO and what exactly does it do for your site ? S.E.O. stands for Search Engine Optimization. There are many different Search Engines, such as Google, Safari, Bing, Yahoo, Youtube, Facebook and many more. Once you begin to type a word you are searching for, the search engine automatically gives you hints. It offers you the most relevant results on the www (world wide web) . SEO is the key ingredient for your page rank. It is like the engine and fuel for your car, thus the better it’s tuned up and more quality fuel (with more octane) it has, the better it will perform in the race for a higher page rank. Therefore, people/clients are able to find you faster and easier. The first part of SEO is to choose your target audience/customers and then carefully decide on what keywords and keyphrases we need to concentrate on the most. Meta titles and Meta descriptions are equally as important for content on every page for the best SEO results. An optimal meta title needs to be formed like this –Title, Page, Separator, Site title– . The second part of SEO is to have the exact number of h-tags on every page. The precise number of h-tags depends on your page size and what the content is about: h1 ‘only one’, h2 ‘depending on the page content’, h3 ‘the same as h2’ and the same for all up to h6. It is a must (your content needs to be original/organic and unique) to not copy & paste from some other websites. All of your images must have Alt tags in order for your website to work properly. The third part of SEO is to add backlinks correctly to any buttons, pictures, keywords and keyphrases. The keywords should be typed bold in some cases. Backlinking needs to be pointed to quality content on quality websites only. There should not be any broken links. If you would like to learn more about quality backlinks visit a blog from Yoast Backlinks. Did you know that SEO has over 200 factors that affect your website page ranking? We use White Hat Techniques only. If you already did some research, you noticed that there are Black Hat techniques within SEO. We definitely recommend that you avoid these, because the Black Hat techniques could will have a negative effect on your site and be hard and time consuming to reverse. The reason why you need an SEO Specialist is to keep your website SEO on the right path. SEO rules change frequently and we are allways up-to-date. Google Positions Tell It All ! Search Engine Optimization should be worked on daily, for the best results do it the right way.